Kirsty Mackay and Amanda Osborne in GamePlan at Pitlochry Festival Theatre. Photo: Douglas McBride. The plays in Alan Ayckbourn’s Damsels in Distress trilogy – originally performed by the Stephen Joseph Theatre Company in 2001 and written to be performed by the same seven actors on the same set – haven’t been presented together since their West End run in 2002. GamePlan, the darkest of the three, explores the relationship between businesswoman Lynette, who lost big in the dotcom crash, and her daughter, Sorrel who is working as a high-class call girl called ‘Mandy.’ When one of Mandy’s clients dies in their apartment, the police come knocking at their door. 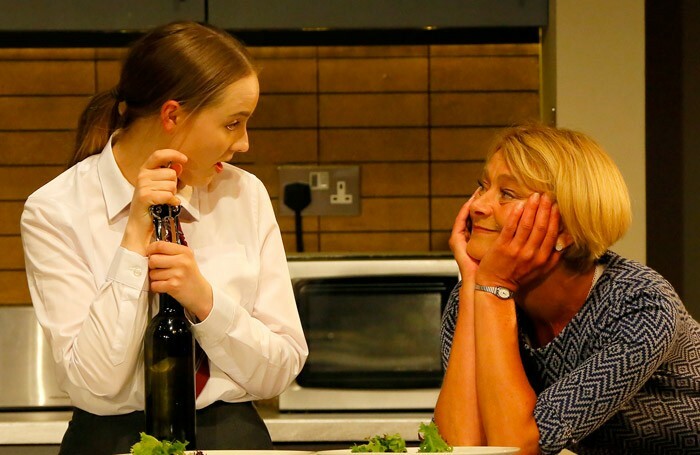 There’s a natural relationship between Amanda Osborne’s Lynette and Kirsty Mackay’s Sorrel – they flit easily between sympathy, loyalty, anger and huffiness – which is at odds with the over-the-top, almost pantomimic, characters of school pal Kelly, who is inveigled into Sorrel’s ill-conceived plans, and the police offers. Kelly is outrageously played by Gemma McElhinney with clipped posh accent and distorted vowels. The double act, of good cop and bad cop Dan (David Mahoney) and the bible-quoting Grace (Stephanie Willson), is also rather broadly played. Owen Aaronovitch is suitably insipid as Mandy’s unfortunate client Leo and there’s a nice line in confusion by Christopher Price as reporter Troy. Director Richard Baron and designer Ken Harrison have worked together on many occasions at this venue before. The set is sumptuous – a riverside apartment with large sliding doors leading out to a balcony with an impressively realistic view across the Thames. But the production as a whole remains a curious mix of subtle comedy and broad farce.